In this world of backstabbing corrupt politics, economic crises, climate change repercussions, terrorist attacks and life-threatening viruses, isn't it nice when people don't take themselves too seriously. 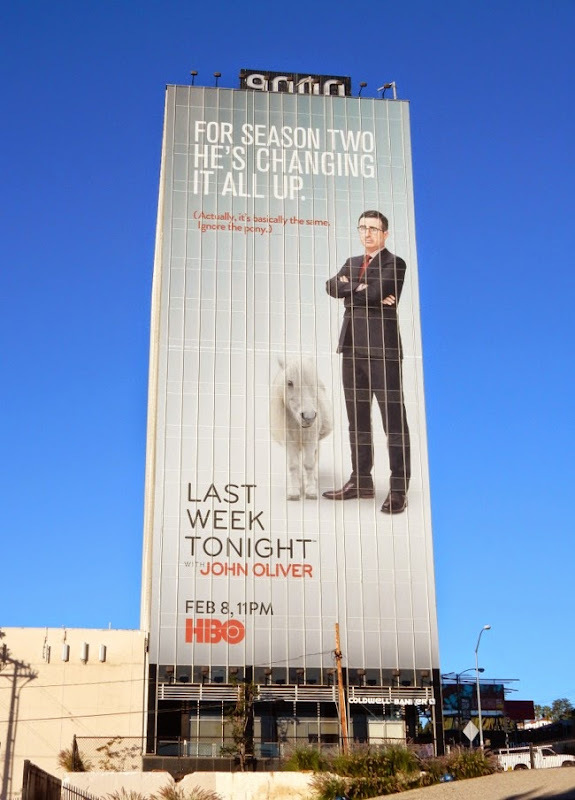 Case in point, the sophomore season promo billboards for Last Week Tonight with John Oliver, which have just the right amount of wit and irreverence to put a smile on even the most jaded cynic. 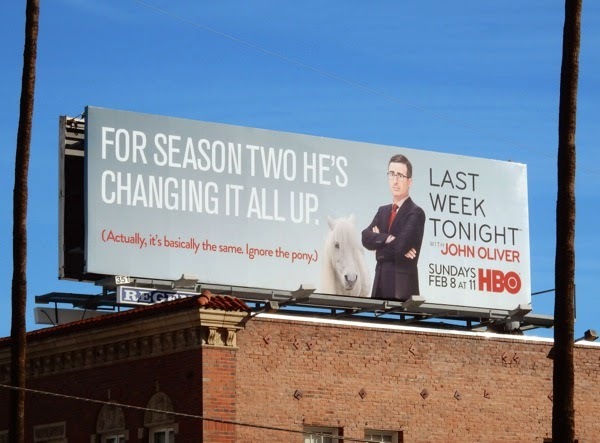 The massive headline proclaims that 'For season two he's changing it all up' and then in smaller type the punchline is, 'Actually, it's basically the same. Ignore the pony'. 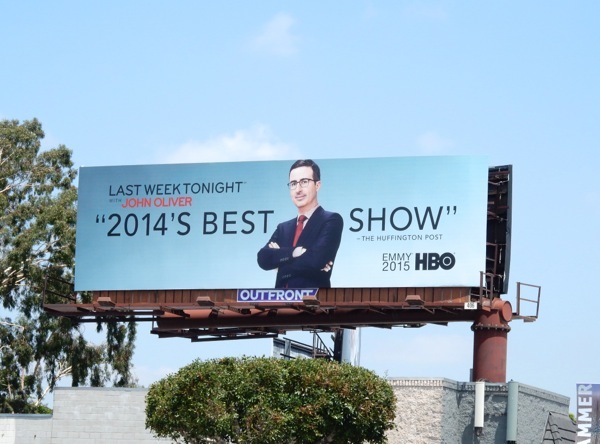 Not only is it hilarious, but why fix something which isn't broken. 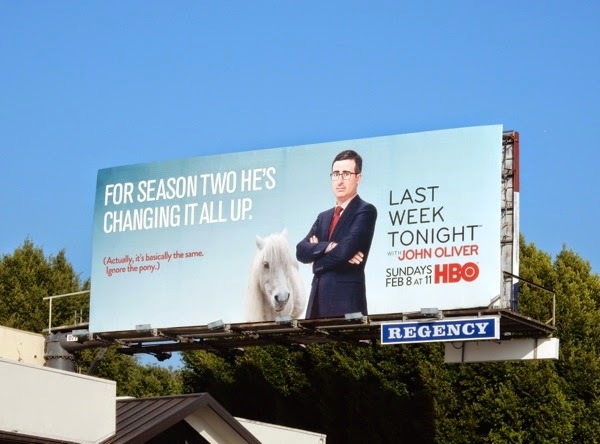 The inclusion of the pony just helps to highlight John Oliver's light-hearted, always insightful and highly satirical approach to the past week in the spheres of news, politics and world current affairs. Now that's how you make a normal looking, spectacle-wearing guy in a suit and tie, who talks about politics for a living, more interesting (maybe a prop is something that Bill Maher should think about to mix up the advertising for his show, now in its thirteenth season). 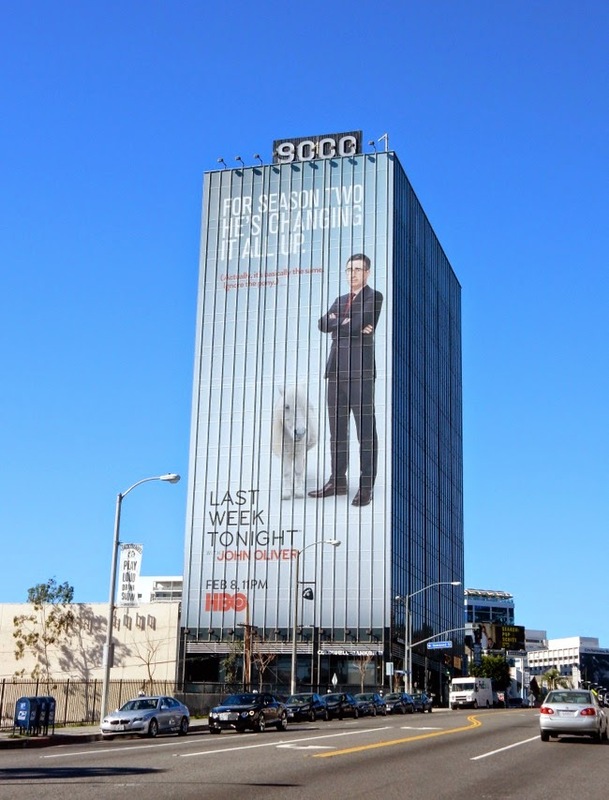 The fun standard landscape billboards were first spied along Sunset Boulevard on January 14, whilst the super-sized pony ad creative was snapped westbound along the Sunset Strip on January 23, 2015. 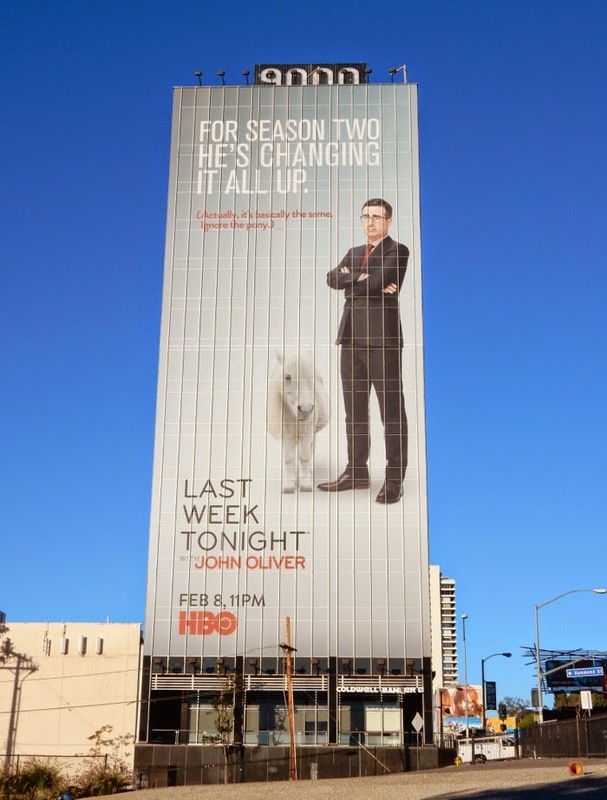 If you're a fan of the show, be sure to also enjoy these season one billboards for Last Week Tonight with John Oliver from last April, which had the more subtle device of the comedian host having two pairs of glasses. 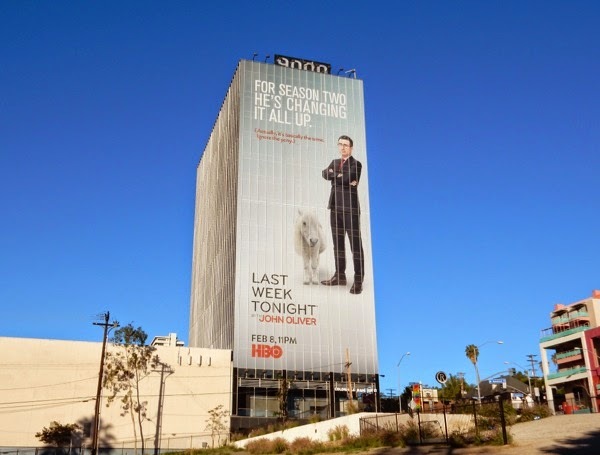 Happy fun day Friday, may the laughs be with you this weekend. 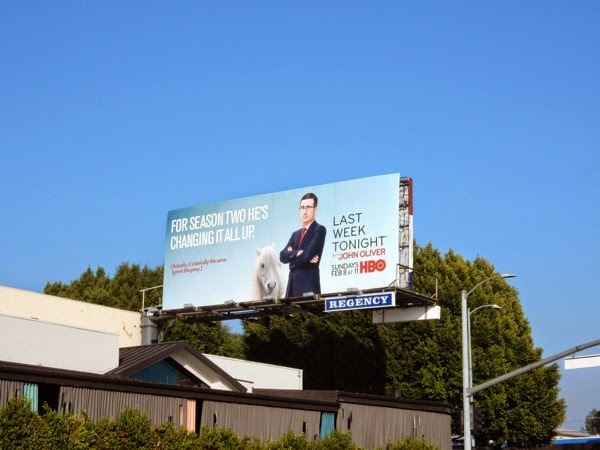 UPDATED: Here's the season two creative updated without the pony for the show's Emmy consideration campaign, snapped along La Cienega Boulevard on May 19, 2015.